The alcohol content of Carling - one of the most popular lagers in the UK - is weaker than advertised, it has emerged. Carling advertises the lager as 4% alcohol by volume (ABV) but it has been brewed at 3.7% since 2012, its US owners Molson Coors have said. 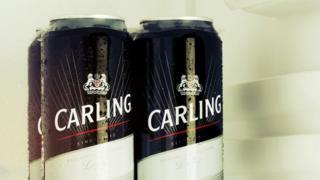 ABV was reduced in order to cut tax on Carling products, the firm said during a hearing brought by HMRC. Molson Coors said beer was allowed to have a natural variation of 0.5%, and said customers had not been misled. There is no suggestion Molson Coors has broken any laws. Beer brewed in the UK is subject to excise duty decided by its alcoholic strength - meaning stronger products pay higher rates of tax. According to documents from the tax tribunal - held in February and March this year - HMRC argued Carling had underpaid tax by more than £50m between 1 September 2012 and 31 January 2015. It claimed the owners of Carling should have paid tax according to the 4% alcohol strength stated on cans, bottles and other products. However, the firm successfully argued the actual strength of the lager meant it was right to pay less tax. Giving evidence to the tribunal, Philip Rutherford, vice president of tax for Molson Coors Europe, argued Carling it should pay tax on "the actual ABV of the beer" rather than the one stated on the label. According to the papers, Mr Rutherford told the tribunal the "key driver" behind the decision not to change the labelling on Carling products was to stop retailers - including supermarkets and pub chains - demanding "a slice" of the savings. The tribunal found in favour of Molson Coors. According to EU laws relating to the labelling of alcohol, products are allowed an ABV tolerance of +0.5% or -0.5% on products between 1.2% and 5.5% ABV. Molson Coors said Carling customers have not been misled. "As a major brand, the trust of our consumers is paramount. We abide by all legal requirements in the brewing and labelling of Carling," it said in a statement. "The natural process of brewing means all batches of Carling vary fractionally in alcohol content - the variation range for Carling is less than a quarter of 1% (0.23%). "It is completely normal for consumable products to have a slight variation. For example, the allowed variation for wine is 1%."